If the name itself isn't ridiculous enough to grab your attention, I don't know what would. Those of you who have already come across this brand would know that it's a brand known for its lipbalms. They contain no poop. They are just simple, natural lipbalms with a goofy brand name. Very contrarian indeed. I like that. I've also read of people buying these lipbalms as a joke for their family and friends. Wichita-based Simone Chickenbone is the name of the company behind Chicken Poop and it's obvious that they love humour. On the website, there is a lot of wordplay, for example, Pile of Poop (if you purchase multiple tubes) and La Chick Poo Poo (a range of coloured lip shimmers). The founder's name is Jamie Tabor (no, no, it's not Simone Chickenbone). From what I've read, she seems to have a flair for entrepreneurship. The first product she developed back in 2000 was a hair pomade, which was a success. 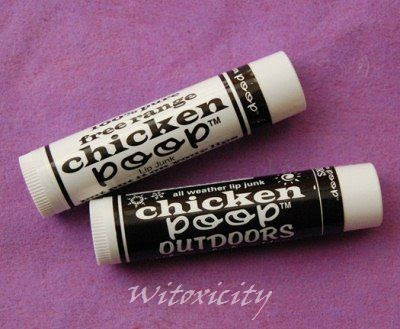 When she developed her lipbalm, she got the inspiration for the Chicken Poop name from her grandfather who used to say, "put some chicken poop on your lips so you won't lick 'em". So, there you have it! These lipbalms come in two versions. 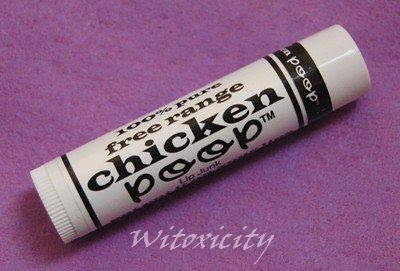 The normal lipbalm in the predominantly white packaging is called Chicken Poop Lip Junk. The other one in the predominantly black tube is for outdoor use, hence, Chicken Poop Outdoors. 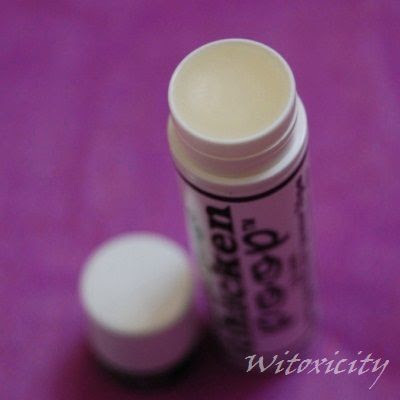 So, here are the thoughts of a lipbalm junkie on the Lip Junk and its outdoor counterpart. I like this one very much. The balm looks like most lipbalms - off-white and translucent - and has no particular taste. The texture is just right and it glides on easily. The lips are left nicely moisturised, also when used overnight. Avocado oil, jojoba oil, sweet orange essential oil, lavender essential oil, beeswax, and Vitamin E.
There is one very important thing to note though and it may be a big deciding factor on whether or not you will love this lipbalm: its lavender scent. Lip Junk also contains sweet orange essential oil but it's the lavender scent that dominates. 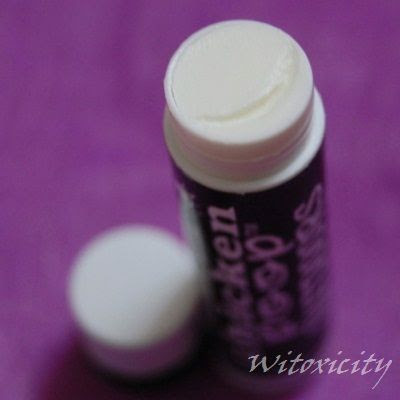 I'm not a big fan of the scent of lavender (but I don't hate it) and that's why I hesitate to say that I love this lipbalm. It's a good lipbalm nevertheless. I finished my tube in about three months. I hate this one. This is meant for outdoor use and it is great that it has sunscreen (zinc oxide). The SPF is not stated though. As you can see, the balm is opaque white. Avocado oil, beeswax, zinc oxide, vitamin e, sweet orange essential oil. Outdoors has a pleasant orangey scent. • While it does glide on all right, it doesn't apply evenly on the lips. It's grainy and sometimes, I see thick, flat bits on my lips which need evening out with the finger or by pursing my lips repeatedly. • It leaves an awful white layer on the lips. You'll end up with white-ish lips which reminds me of, at best, those hunky beach lifeguards, and at worst, a corpse. There are other better lipbalms with sunscreen, so I would give this one a miss, unless you're a beefy beach lifeguard. I'm having a hard time finishing my tube. I've seen various prices for these lipbalms (Net weight 0.15oz / 4.2g). On the Chicken Poop website, they are USD4.00 each. On iHerb, for example, it's USD2.00 for Lip Junk and USD2.40 for Outdoors. 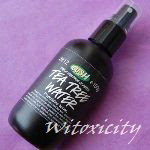 My iHerb coupon code QOJ683 will get you a US$10 discount on orders of US$40 or more, or a US$5 discount on orders less than US$40. Gross lol The ingredients list makes me want to check them out though. Thanks for the review! I have to get hold of some of that. I bought my husband cat poop for Christmas. If I recall, it's an anti fogger for sunglasses/goggles. With the name I wouldn't buy it!!! LOL!! That name is sooo funny, hilarious and easy to remember.......good name for marketing. Haha :DDDD! The name is awesome! I find it hilarious you wrote a review for this, but I don't know why. Probably because it's so 'Beauty stuff, beauty stuff... Suddenly! CHICKEN POOP! D:!'. Thanks for the laugh :)! 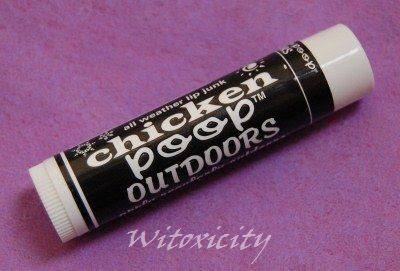 I posted a review on Chicken Poop lip balm on April Fool's Day a couple of years ago. It's good enough that I thought of maybe having it as a stocking stuffer for Christmas that year. I'm glad you found a site where people can get it cheaper. I bought mine at health food store and it was close to $4. OMGosh, that is such a funny coincidence! Haha! Yes, do buy one for him and see how he reacts when he opens the gift. Hee hee!